To illustrate the fundamentals of an airborne time domain EM survey, provide a vision for how it is applied in the field, and demonstrate potential uses. 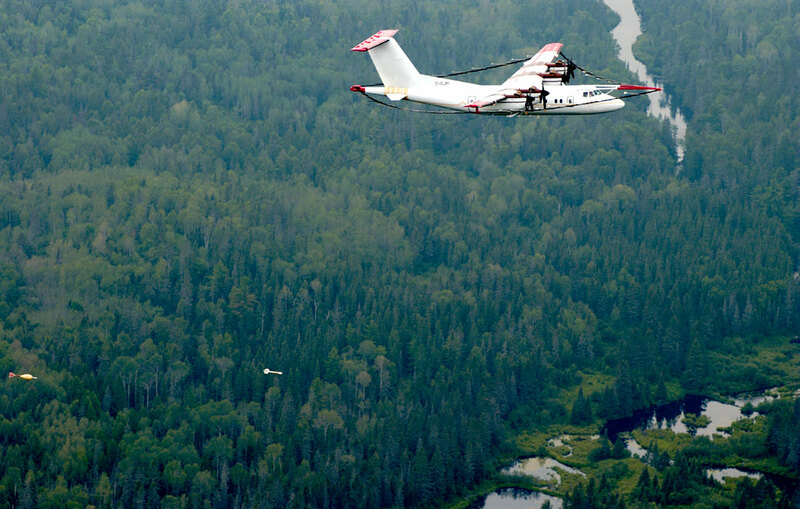 An airborne EM survey relies on the inductive coupling between the instrument and the ground, a mechanism more suitable for portable or towed systems. Because it uses a loop as the transmitter and another loop as the receiver, it is sometimes referred to as “loop-loop” system. As presented in airborne FDEM, a loop-loop system can operate at multiple frequencies to gain depth resolution in the earth. A single-frequency time- harmonic coil is easy to create electronically, but such a system can only sample discrete frequencies. Also the multi-coil arrangement in an AFEM system limits the dipole moment of the transmitter loop, so its depth of penetration is relatively shallow. A loop-loop system in time domain can overcome those drawbacks by transmitting a current in a waveform with abrupt change that spreads over a wide and continuous range of spectrum. By adjusting the transmitter moment, an ATEM system can effectively explore from near surface to great depth. As a result of better electronic techniques, ATEM has gained popularity over the last decade, and is an industrial standard in many applications. Airborne EM is ideal for surveying a large area, so it has been used in geological mapping and regional assessment for groundwater, mineral/petroleum exploration and geothermal resource. An important feature of ATEM is that its transmitter can vary from a relatively small loop towed by a helicopter to a large loop mounted on a fixed-wing airplane. This makes it suitable for a variety of geoscientific applications from environmental to deep exploration.